The ancient open amphitheatres and the roofed odeia of the Greek-Roman era present the earliest testament of public buildings designed for effective communication of theatrical and music performances over large audiences, often up to 15000 spectators [1-4]. Although mostly located around the Mediterranean, such antique theatres were built in every major city of the ancient world in Europe, Middle East, North Africa and beyond. Nearly 1000 such buildings have been identified, their evolution starting possibly from the Minoan and archaic times, around 12th century BC. However, the known amphitheatric form appears during the age that saw the flourishing of philosophy, mathematics and geometry, after the 6th century BC. These theatres were the birthplace of the classic ancient tragedy and comedy plays fostering theatrical and music activities for at least 700 years, until their demise during the early Christian era. After a gap of 1000 years, public theatres, opera houses and concert halls, often modelled on these antique buildings, re-emerged in Europe during the Renaissance era. During the antiquity, open theatres were mainly used for staging drama theatrical performances so that their acoustics were tuned for speech intelligibility allowing very large audiences to hear clearly the actors and the singing chorus. 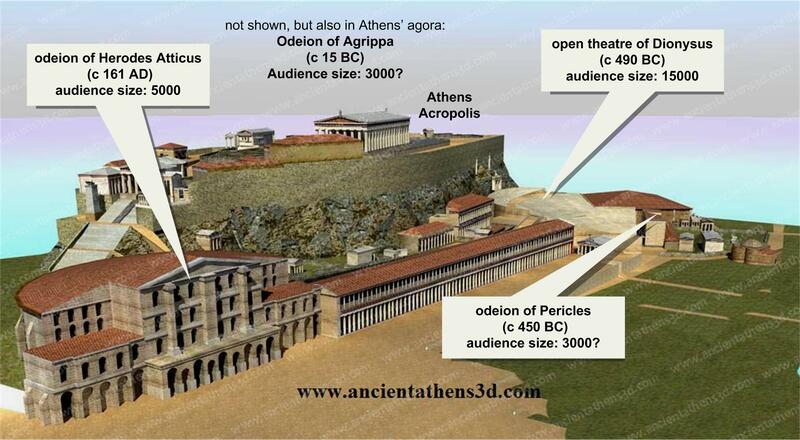 During this era, smaller sized roofed versions of these theatres, the “odeia” (plural for “odeon”), were also constructed [4, 5], often at close vicinity to open theatres (Figure 1). The odeia had different acoustics qualities with strong reverberation and thus were not appropriate for speech and theatrical performances but instead were good for performing music functioning somehow similarly to modern-day concert halls. Figure 1: representation of buildings around ancient Athens Acropolis during the Roman era. Besides the ancient open amphitheatre of Dionysus, the roofed odeion of Pericles is shown, along with the later period odeion of Herodes (adopted from www.ancientathens3d.com ). The open antique theatre signifies the initial meeting point between architecture, acoustics and the theatrical act. This simple structure consists of the large truncated-cone shaped stepped audience area, (the amphitheatrical “koilon” in Greek or “cavea” in Latin), the flat stage area for the chorus (the “orchestra”) and the stage building (the “skene”) with the raised stage (“proskenion”) for the actors (Figure 2). Figure 2: structure of the Hellenistic period open theatre. The acoustic quality of these ancient theatres amazes visitors and experts alike. Recently, the widespread use of acoustic simulation software and of sophisticated computer models has allowed a better understanding of the unique open amphitheatre acoustics, even when the theatres are known solely from archaeological records [1,3,7,9,11]. Modern portable equipment has allowed state-of-the-art measurements to be carried out in some well-preserved ancient theatres [8,10,13]. As a test case, the classical / Hellenistic theatre of Epidaurus in southern Greece is often studied which is famous for its near-perfect speech intelligibility [12,13]. Recent measurements with audience present (Figure 3) confirm that intelligibility is retained besides the increased audience sound absorption . Figure 3: Acoustic measurements at the Epidaurus theatre during recent drama play ( form Psarras et al.). 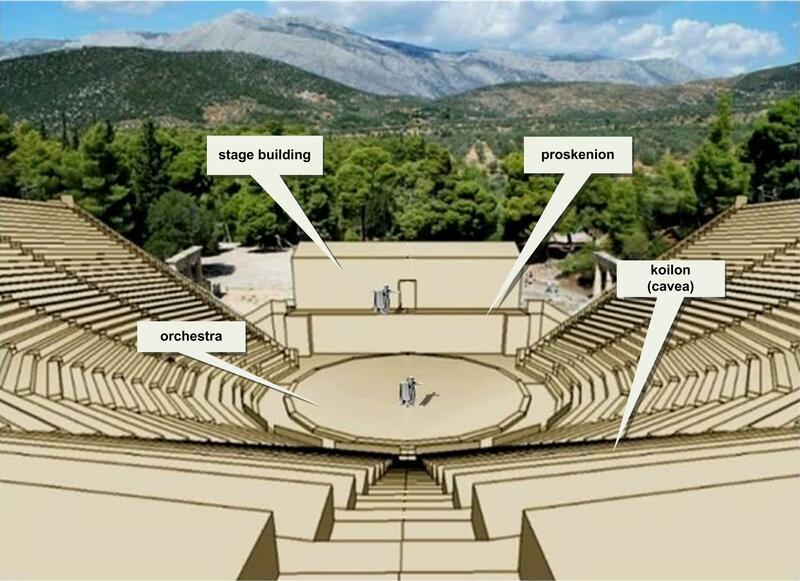 It is now clear that the “good acoustics” of these amphitheatres and especially of Epidaurus, is due to a number of parameters: sufficient amplification of stage sound, uniform spatial acoustic coverage, low reverberation, enhancement of voice timbre, all contributing to perfect intelligibility even at seats 60 meters away, provided that environmental noise is low. These acoustically important functions are largely a result of the unique amphitheatrical shape: for any sound produced in the stage or the orchestra, the geometric shape and hard materials of the theatre’s surfaces generate sufficient reflected and scattered sound energy which comes first from the stage building (when this exists), then the orchestra floor and finally from the surfaces at the top and back of seat rows adjacent each listener position and which is uniformly spread to the audience area [11,13] (see Figure 4 and Figure 5). Figure 4: Acoustic wave propagation 2D model for the Epidaurus theatre. The blue curves show the direct and reflected waves at successive time instances indicated by the red dotted lines. Along with the forward propagating wavefronts, backscattered and reflected waves from the seating rows are produced (from Lokki et al. ). 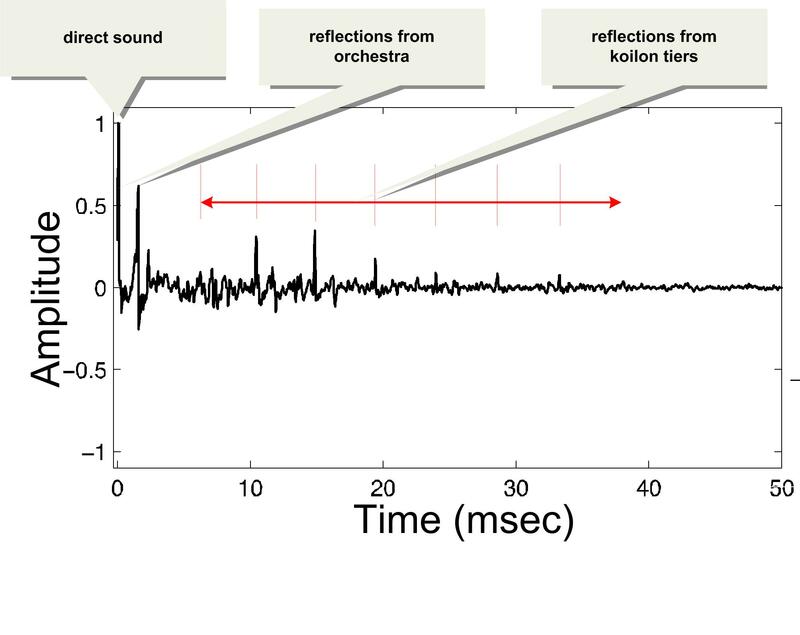 This reflected sound energy reinforces the sound produced in the stage and its main bulk arrives at the listener’s ears very shortly, typically within 40 milliseconds after the direct signal (see Figure 5). Within such short intervals, as far as the listeners’ brain is concerned, this is sound also coming from the direction of the source in the stage, due to a well-known perceptual property of human hearing, often referred to as “precedence or Haas effect” [11,13]. Figure 5: Acoustic response measurement for the Epidaurus theatre, assuming that the source emits a short pulse and the microphone is at a seat at 15 meters. Given that today the stage building does not exist, the first reflection arrives very shortly from the orchestra ground. Seven successive and periodic reflections can be seen from the top and the risers of adjacent seat rows. Their energy is reduced within approx. 40 milliseconds after the arrival of the direct sound (from Vassilantonopoulos et al. ). The dimensions for seating width and riser height, as well as the koilon slope, can ensure minimal sound occlusion by lower tiers and audience and result to the fine tuning of in-phase combinations of the strong direct and reflected sounds [9,11]. As a result, frequencies useful for speech communication are amplified adding a characteristic coloration of voice sound and further assisting clear speech perception . These specific amphitheatre design details have been found to affect the qualitative and quantitative aspects of amphitheatre acoustics and in this respect, each ancient theatre has unique acoustic character. Given that the amphitheatric seating concept evolved from earlier archaic rectangular or trapezoidal shaped seating arrangements with inferior acoustics (see Figure 6), such evolution hints at possible conscious acoustic design principles employed by the ancient architects. 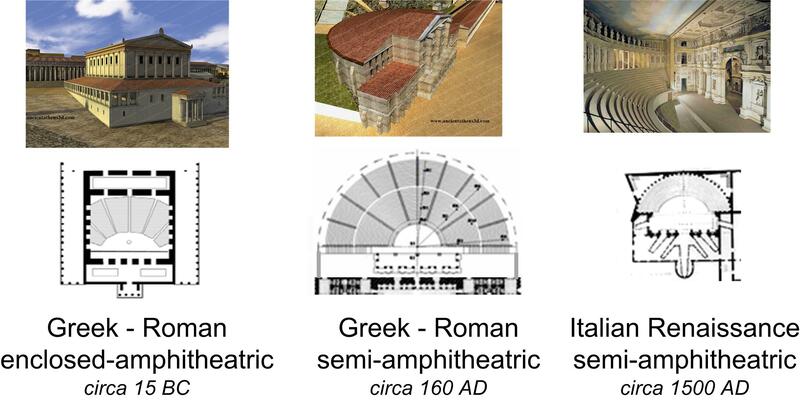 During the Roman period, stage building grew in size and the orchestra was truncated, showing adaptation to artistic, political and social trends with acoustic properties correlated to intended new uses favouring more the visual performance elements [4,15]. Unfortunately, only few fragments of such ancient acoustic design principles have been found and only via the writings of the Roman architect Marcus Vitruvius Pollio (70-15 BC), . Figure 6: Evolution of the shape of open theatres. Roman period theatres had semi-circular orchestra and taller and more elaborate stage building.The red lines indicate the koilon / orchestra design principle as described by the ancient architect Vitruvius. Although the form of ancient odeia broadly followed the amphitheatric seating and stage / orchestra design, they were covered by roofs usually made from timber. This covered amphitheatric form was also initially adopted by the early Renaissance theatres, nearly 1000 years after the demise of antique odeia  (Figure 7). Figure 7: Different shapes of roofed odeia of antiquity and the Renaissance period (representations from www.ancientathens3d.com ). Supporting a large roof structure without any inner pillars over the wide diameter dictated by the amphitheatric shape, presents even today a structural engineering feat and it is no wonder that odeia roofs are not preserved. Without their roofs, these odeia appear today to be similar to the open amphitheatres. However, computer simulations indicate that in period, unlike the open theatres, they had strong acoustic reverberation and their acoustics helped the loudness and timbre of musical instruments at the expense of speech intelligibility, so that these spaces were not appropriate and were not used for theatrical plays [4,5]. For the case of the Herodes odeion in Athens (Figure 8), computer simulations show that the semi-roofed version had up to 25% worst speech intelligibility compared to the current open state, but the strong acoustic reverberation which was similar to a modern concert hall of compatible inner volume of 10000 m3, made it suitable as a music performance space . Figure 8: The Herodes odeion at its current state and via computer model of the current open and its antique semi-roofed version. (from Vassilantonopoulos et al. ). Very recent archaeological evidence indicates that the roof covered fully the building, as is also shown in Figure 10. Thousand years ago, these antique theatres established acoustic functionality principles that even today prevail for the proper presentation of theatre and music performances to public audiences and thus signal the origins of the art and science in building acoustics. Please use headphones for more realistic 3D sound effect. F. Canac, “L’acoustique des théâtres antiques”, published by CNRS, Paris, (1967). R. Shankland, “Acoustics of Greek theatres”, Physics Today, (1973). K. Chourmouziadou, J. Kang, “Acoustic evolution of ancient Greek and Roman theatres”, Applied Acoustics vol.69 (2008). G. C. Izenur, “Roofed Theaters of Classical Antiquity”, Yale University Press, New Haven, Connecticut, (1992). S. Vassilantonopoulos, J. Mourjopoulos, “The Acoustics of Roofed Ancient Odea”, Acta Acoustica united with Acustica, vol.95, (2009). D. Tsalkanis, www.ancientathens3d.com, (accessed April 2015). S. L. Vassilantonopoulos, J. N. Mourjopoulos, “A study of ancient Greek and Roman theater acoustics”, Acta Acustica united with Acustica 89 (2002). A.C. Gade, C. Lynge, M. Lisa, J.H.Rindel, “Matching simulations with measured acoustic data from Roman theatres using the ODEON programme”, Proceedings of Forum Acusticum 2005, (2005). N. F. Declerq, C. S. Dekeyser, “Acoustic diffraction effects at the Hellenistic amphitheatre of Epidaurus: Seat rows responsible for the marvellous acoustics”, J. Acoust. Soc. Am. 121 (2007). A. Farnetani, N. Prodi, R. Pompoli, “On the acoustics of ancient Greek and Roman theatres”, J. Acoust. Soc. Am. 124 (2008). T. Lokki, A. Southern, S. Siltanen, L. Savioja, “Studies of Epidaurus with a hybrid room acoustics modelling method”, Acta Acustica united with Acustica, vol.99, 2013. S. Vassilantonopoulos, T. Zakynthinos, P. Hatziantoniou, N.-A. Tatlas, D. Skarlatos, J. Mourjopoulos, “Measurement and analysis of acoustics of Epidaurus theatre” (in Greek), Hellenic Institute of Acoustics Conference, (2004). S. Psarras, P. Hatziantoniou, M. Kountouras, N-A. 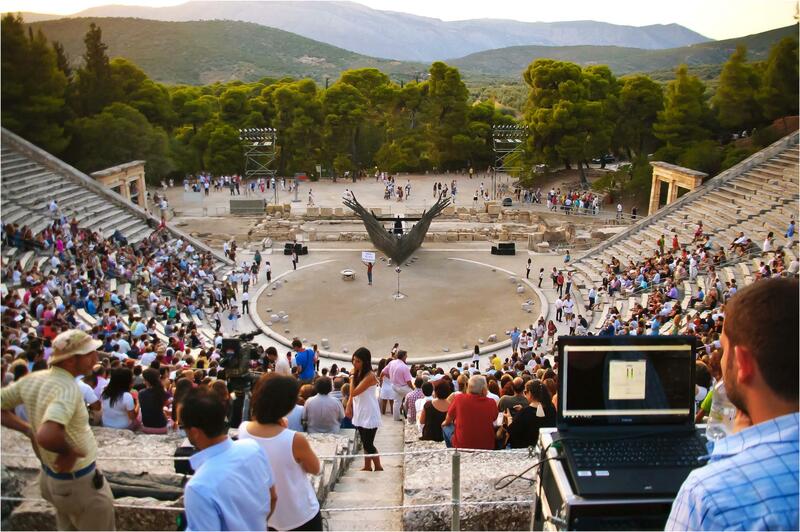 Tatlas, J. Mourjopoulos, D. Skarlatos, “Measurement and Analysis of the Epidaurus Ancient Theatre Acoustics”, Acta Acustica united with Acustica, vol.99, (2013). Vitruvius, “The ten books on architecture” (translated by Morgan MH), London / Cambridge, MA: Harvard University Press, (1914). Beckers, Benoit, N.Borgia, “The acoustic model of the Greek theatre.” Protection of Historical Buildings, Prohitech09, (2009). M. Barron, “Auditorium acoustics and architectural design”, London: E& FN Spon (1993).